In the UK's Prospect magazine, the cover story, an epistolary debate between author (and Outside.in founder) Steven Johnson and Princeton professor of communications and public affairs Paul Starr, is headlined Will the coming age of news be better than the old? Interestingly enough, both the optimistic Johnson and pessimistic Starr cite Atlantic Yards and AYR to buttress their arguments. I think that any discussion of the media ecology around Atlantic Yards needs several explanatory footnotes, which I offer below, but I believe that the volunteer media response to Atlantic Yards is an unusual phenomenon, not easily duplicable, which places me much closer to Starr's camp. Someone has to do the work of journalism--reading documents, showing up at meetings, asking questions, making analytical connections over a period of time--and it's not easy. Johnson's piece in Prospect draws on his recent speech titled Old Growth Media and the Future of News, and followed up with a blog post headlined Old Growth Media, the Aftermath. Starr draws on a New Republic cover story headlined Goodbye to the Age of Newspapers (Hello to a New Era of Corruption). we’ve been living with for the past century. His examples from the recent past are technology coverage, which has become much richer (and augmented by talented amateurs via blogs), as well as political news. But I think he already starts mixing things up when he cites web sites like Talking Points Memo and Politico, both of which are professional sites supported by investors and advertisers. Johnson acknowledges the complaint that bloggers are parasitic, but says it's not the case, citing the example of a quote that came from the Huffington Post. Fine, but that's just one example. movies, books, restaurants, and local news. I agree that a new model of news and public controversy is emerging online and that in some respects, particularly the range of opinion it accommodates, the online environment has advantages over the traditional world of print. But the reality is that resources for journalism in the United States, especially at the metropolitan and regional level, are disappearing faster than the new media can create them. The profits newspapers made cross-subsidized public service journalism--which, I'd observe, has varied significantly among newspapers. The result: a loss of trained observers: in New Jersey, the number of statehouse political reporters has gone from 50 to 15. There are really three separate problems here: the production of professionally reported news; the production of an engaged public; and the production of effective political accountability. While the internet unquestionably offers a diversity of opinion and access to new sources, it is not sustaining general-interest professional journalism at its previous levels. Starr thinks that both government policy and philanthropy must be "spurred to support independent journalism in new ways." But he sees the loss of a newspaper as diminishing the "creation of an engaged public." For the past three years, the dominant civic issue in Brooklyn has been a controversy over the Atlantic Yards, a big urban redevelopment project. On Outside.in the page for the Atlantic Yards brings together news, reporting, commentary and chatter. There are 30 stories from the past five days. The New York Times print edition ran exactly one story mentioning it in the past month. What does that mean, 30 stories? Outside.in is just aggregating my posts, NoLandGrab, the Brooklyn Paper, and other sources you can all find on NLG. How much richer will coverage of an important civic issue like Atlantic Yards be in five years? As you say, it’s risky to guess, so let’s imagine a future based entirely on existing enterprises and websites. Here’s what I think it will look like. 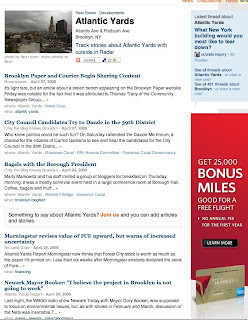 Big bloggers, like the Brooklyn real estate blog Brownstoner, will break stories, comment on events, and even make money. Data platforms like Everyblock will make people aware of new filings by property developers. Muckrakers with a passion—like the feisty Atlantic Yards Report blog—will show up at every hearing with tough questions, and post annotated transcripts. Local amateurs will scour public documents for revealing details, while parents at hearings will blog about the impact on specific schools in the shadow of the project. And then sites like Outside.in will circulate their remarks to readers who live in that school zone, while new charitable organisations like Spot.us will fund investigative articles into the background of the developers. If they are smart, New York newspapers like the Times and the Post will draw upon this coverage, share it with their readership, use it to sell local ads, and sometimes put one of their trained reporters to develop new stories. The latter will, in turn, add immense value to the information chain, and the whole cycle will start over again. Really? Brownstoner's one guy (plus freelancers), and he's too busy writing about real estate to go deep with original reporting on any one story. Everyblock isn't going to deliver the AY data that must be extracted via Freedom of Information Law requests. Aggregators like the volunteers behind NoLandGrab.org, who analyze and comment on AY news with bite after having been immersed in it for years, do so at significant personal sacrifice. As for local amateurs stepping up, consider that Tuesday night the new Times blog The Local sponsored a panel discussion on the past, present, and future of Fort Greene and Clinton Hill. According to Outside.in, Clinton Hill is supposedly the "bloggiest" neighborhood in the country and, while that's not true, a bunch of local blogs are linked from The Local. None of them covered the panel beyond AYR and The Local itself. Outside.in surely has its uses, but it's essentially irrelevant to the Atlantic Yards debate. Even Forest City Ratner officials go to NoLandGrab. And the New York Times surely isn't going to link to or "curate" content that takes them to task, like my post on the newspaper's failure to report on Forest City Ratner's bailout of ACORN. Starr honed in by criticizing Johnson's AY example, nothing that Outside.in does no original reporting nor even analyzes what it collects. Starr asked me to comment, and I confirmed that it aggregates coverage, "piggybacking notably" on AYR and NLG. Starr added that Outside.in doesn't pay me or anyone else and relies on others to pay for original reporting. Nothing that you have said addresses this decline in reporting and its implications for political accountability, and your site is certainly no solution—you can’t aggregate stories that aren’t being written. Solving that problem is going to demand new investments in journalism by nonprofit organisations, new business models that finance reporting, and new public policies that allow news organisations to capture more of the revenue from the public good they produce. And while we’re on the subject of revenue, how about paying Norman Oder and others for the work that you’ve been touting as if it were your own site’s contribution to public debate? Johnson acknowledges that Outside.in doesn’t do original reporting and cited Atlantic Yards "to show the volume of information already created about a civic issue in Brooklyn." However, in provoking a sophisticated and sustained online response, Atlantic Yards is probably an anomaly. 1) It's a very controversial project (basketball arena + 16 towers). 2) Brooklyn is vastly undercovered. 3) Atlantic Yards impacts neighborhoods with a critical mass of well-educated people, of whom there are a few with enough free time and feistiness to look closly at the controversy, both via blogs and via organizations like Develop Don't Destroy Brooklyn. 4) The local weekly Brooklyn Paper aggressively covered Atlantic Yards for years. Shouldn't some bloggers have dissected the equally-controversial deal to build a new Yankee Stadium? But the South Bronx was not about to spawn such blogs. We organise and amplify those voices. We help newspapers connect to bloggers, and help bloggers to get their stories onto “old media” sites. Eventually, we’ll help businesses to run geographically-targeted ads. And when we do, if Norman Oder at Atlantic Yards Report wants to run our ads on his pages, we’ll be delighted to write him a cheque every month. Our business succeeds if newspapers are profitable, and if bloggers quit their day jobs. Johnson agrees that traditional reporting skills are needed "for the macro issues, but on the hyperlocal level the true experts are people on the streets." Atlantic Yards is both hyperlocal (and thus too fine-grained in its iterations for daily print coverage) as well as macro (encompassing a wide range of beats, including real estate, public policy, sports business, law, and local politics). So traditional reporting skills are necessary. It's very hard to become an expert on that stuff. Which is why the mainstream media still plays an important role. While I have broken stories by covering events and reading documents, only the New York Times, it seems, can get developer Bruce Ratner to talk. When Ratner talks, sometimes the Times--because its reporters can't devote longitudinal time to Atlantic Yards--misses part of the story. And when Ratner wrote an op-ed in the New York Daily News--which the Daily News treated as gospel in its news pages--I quickly dissected it. So the withering away of newspaper journalism, however inadequate, would give us less to analyze. Starr, who got the last word in the debate, reminded Johnson that nonprofit organizations and philanthropy will have to play "a new role financing investigative and other kinds of reporting" and that regulatory policies could strengthen local news. But he doesn't think that either the market or technology will offer the answer, and predicts that "the new media environment will probably lead to a wider gap between the small minority who take an intense interest in public life, and the considerably larger number who drop out of the public sphere altogether." I can see how the digital divide might exacerbate that; people without computers obviously aren't following web reporting and commentary. On the other hand, mobile devices are going to get cheaper. And I do think that ordinary people can be engaged. One of the things that struck me when I briefly lived in South Africa some 18 years ago was how engaged everyone was in politics--it was a necessity. So if newspapers continue to fade, new models of credible coverage must emerge from all the experiments. And sustainability will have to rely on more than [fixed 5/7] a supremely ornery response to a bigfoot real estate developer.